Backed by profound experience of this industry, we have come up with high grade Dual Winder Machine. Our sourcing agents ensure that the raw material for the products is procured from reliable vendors only. To ensure the flawlessness, our quality analysers test these products on various parameters using advanced machines and instruments. Based on the varied torque, speed and weight capacity requirements of our clients, we provide customization for the product. 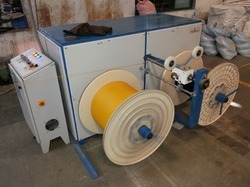 We have created a niche in the industry by offering a supreme quality range of Dual Winder Machine. These machines exemplify the expert and efficient workmanship of our intelligent professionals. This range of products are uniquely designed for a long functional life and high performance. We expertise in manufacturing custom Dual Winders based on the speed, torque and weight capacity requirements. Moreover, our entire production process is conducted in adherence with the industry standards and norms. Looking for Dual Winder Machine ?